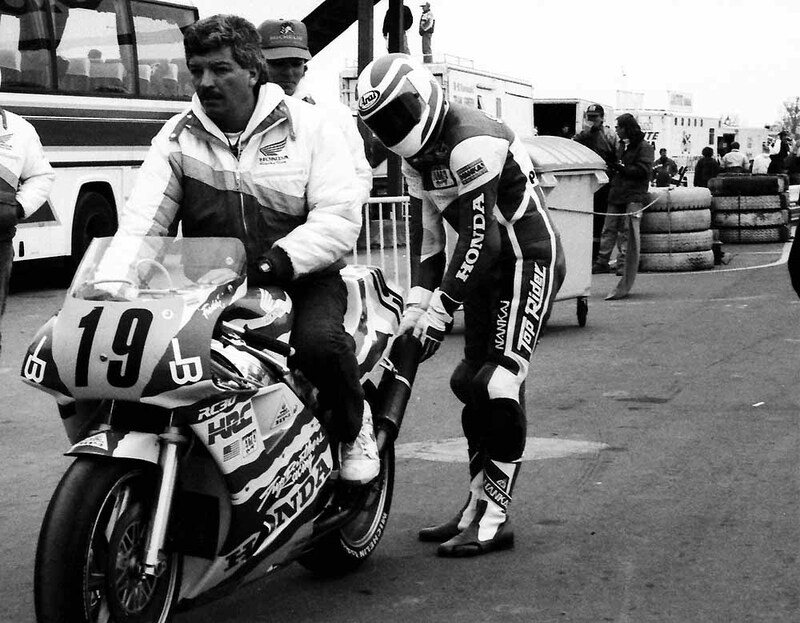 Freddie Spencer had been around racing Hondas enough that he knew every possible application for them, including it seems as hand warmers. The Mallory Park segment of the 1991 Transatlantic Match Races dawned freezing cold. As riders readied to head out for the morning practice session they were jumping in place, wore warm coats over their leathers and stayed in heated vehicles until the last possible moment. Spencer did all that, then found a way to put just a little extra heat into his fingers by holding his hands up to the exhaust of the Two Brothers Honda RC30 being warmed up by his mechanic Mike Velasco. Perhaps the Americans riders were running less acclimated than they should have been, having left the warm environs of Daytona Beach, Florida and the Daytona 200 a week or two earlier.